Data is from the October 2015 Kantar Millward Brown report titled "AdReaction: Video Creative in a Digital World" conducted by On Device Research as cited in company blog. 13,600 internet users ages 16-45 worldwide were surveyed via mobile device by On Device Research during July 2015. 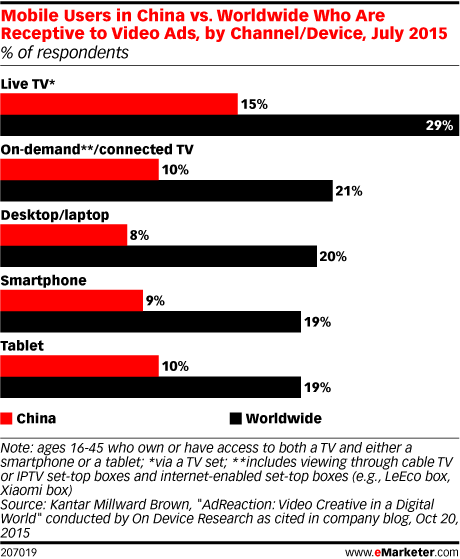 Respondents identified themselves as multiscreen consumers, which is defined as people who own or have access to both a TV and either a smartphone or tablet. At least 300 respondents were surveyed from each of the 42 countries included in the study.